I-69 is a currently existing highway in Michigan and Indiana. Proposals exist to extend the route from Indianapolis to southern Texas. In fact, construction has begun on I-69 in northern Mississippi. This proposed extension would enter Kentucky near Henderson and leave the state near Murray and Fulton. The corridor for the proposed interstate is now legally defined as following the Julian M. Carroll Purchase Parkway. The 2002 and 2003 Kentucky Official Highway maps indicate the proposed corridor for Interstate 69, and "Future I-69" signs may soon begin appearing along the Purchase Parkway. AARoads.com: Corridor 18 - History and details about the proposed Interstate 69 corridor. Evansville Courier & Press: Following I-69 - Coverage of Interstate 69 from the Evansville Courier & Press and The Henderson Gleaner. I-69: Henderson to Evansville - The official website for the environmental study of I-69 between Henderson and Evansville. I69info.com - Chris Lawrence has created this site with links to quite a lot of information about the I-69 project. Kentucky Transportation Cabinet Division of Planning: Proposed Interstate 69 - Information about planning projects concerning I-69 along the Pennyrile and Western Kentucky Parkways. West Kentucky Corporation: Interstate 69 - Maps and information about Interstate 69 in Kentucky, including information about upcoming public meetings. Wikipedia: Interstate 69 in Kentucky - Encyclopedia article regarding the route, its past, present, and future. A contractor for the Kentucky Transportation Cabinet plans a traffic shift in the work zone for the New I-69 Interchange with the Breathitt-Pennyrile Parkway in HOPKINS County on Friday, July 24, 2015. Starting Friday morning, the contractor plans to change southbound traffic on the Pennyrile Parkway to the permanent traffic configuration. That means southbound traffic on the Pennyrile will remain on the southbound lanes of I-69 along the main line, then exit left to continue south on the Pennyrile toward Hopkinsville or to take the exit ramp to the Western Kentucky Parkway eastbound lanes. The movement for southbound traffic wishing to remain on the Pennyrile will require going over the new overpass to get back to the southbound Pennyrile or to access the existing cloverleaf ramp to the right for eastbound WK Parkway access. Motorists should continue to use appropriate caution in this work zone and be prepared for lane restrictions to allow additional construction activities along the interchange. The $29 million design-build contract to reconstruct the interchange to accommodate Interstate 69 was awarded to the Rogers Group, Inc., and QK4 Inc., with an expected completion date in October 2015. Kentucky now has 55 miles of I-69. The route follows I-24 for 17 miles from The Julian Carroll-Purchase Parkway at Calvert City to Eddyville. I-69 then runs for 38 miles along the former Wendell Ford-Western Kentucky Parkway from Eddyville to the Pennyrile Parkway near Madisonville. The I-69 Interchange project in Hopkins County is among about 10 major projects totaling $260 million in new construction aimed at extending I-69 northward along the Pennyrile and southward along the Purchase Parkway. The Green River Area Development District’s regional transportation committee gave unanimous support for the undertaking of a federally funded study to determine the cost of reconstructing the Audubon Parkway as a spur route from the proposed Interstate 69 east of Henderson. The Owensboro Chamber of Commerce believes that an interstate designation for the parkway would make Owensboro more attractive to industrial developers. The Greater Owensboro Chamber of Commerce would like to see studies to determine the feasibility of upgrading to the Audubon and Natcher Parkways to Interstate spur routes. The Audubon Parkway would be a spur route off of the proposed I-69 in Henderson County, and the Natcher Parkway would be a spur route off of I-65 in Warren County. While most of the parkway system consists of four-lane divided limited access highways, most of the parkway system does not meet modern interstate standards. Among the problems are medians that are too narrow, shoulders that are too narrow, not enough open space along the side of the highway, and overpasses that are too low. An upgrade of any parkway to Interstate standards would be an expensive undertaking. Kentucky’s neighbor to the south will move closer to construction of Interstate 69 next year. 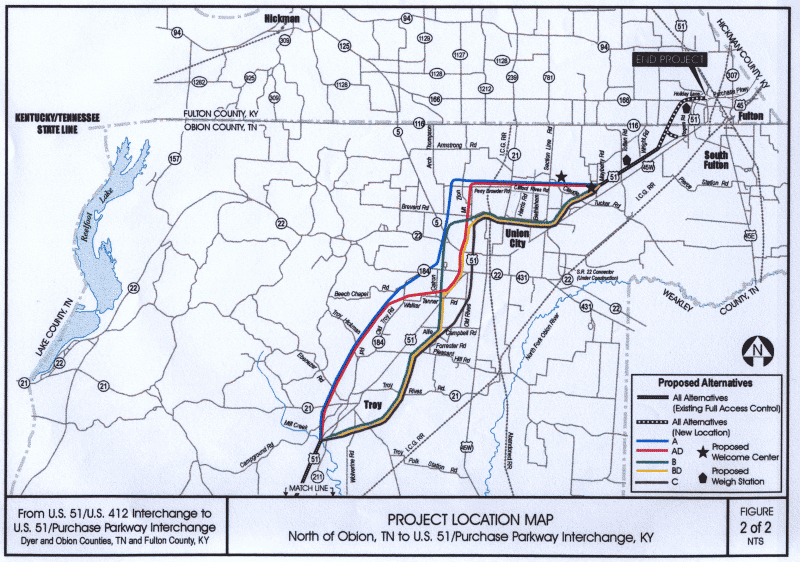 Right-of-way purchase for the route in Obion County, Tennessee is expected to start in early 2005. While several Henderson County road projects are facing delays, transportation officials report that the Final Environmental Impact Statement for the Evansville-Henderson section of I-69 should be complete late this year. Start of the US 60 widening project in southeast Henderson will likely be delayed until 2006 due to slow right-of-way acquisition. Several miles of the Pennyrile Parkway are due to be repaved once money becomes available, and the twin US 41 bridges over the Ohio River are scheduled to be repainted in 2005 and 2006. A group of Hopkinsville leaders are lobbying to have I-69 follow the Pennyrile Parkway through Christian County. Current plans are for I-69 to follow the northern tier of the Pennyrile Parkway, the Western Kentucky Parkway, and the Purchase Parkway. Transportation officials from Kentucky and Indiana held two public meetings this week to discuss the construction of I-69 between I-164 in Indiana and the Pennyrile Parkway in Henderson County. The preferred route will include twelve miles of new highway and a new Ohio River bridge. A Henderson County landowner has asked the Henderson City-County Planning Commission to consider plans for a major subdivision on his land. The land in question, between Wathen Lane and the Ohio River, lies in the path of recently recommended route of I-69. The Evansville Urban Transportation Study has asked to the commission to require that future home buyers be informed of the proposed route of I-69 if plans for the subdivision are ultimately approved. The study consists of evaluating the potential of constructing a new interstate highway between the cities of Henderson and Evansville, as well as the potential for a new Ohio River Bridge between the two cities. Although four alternatives were evaluated in detail, the DEIS identifies one of two eastern alternatives, Alternative 2, as the preferred alternative. Alternative 2 will utilize more than 18 miles of existing I-164 before entering new alignment just east of the Green River Road interchange in Evansville. The Alternative will then travel south on new alignment across a new Ohio River bridge crossing where it will connect to the Breathitt Parkway in Henderson, KY. The total length of Alternative 2 is approximately 30.2 miles and is estimated to cost approximately $652 million to construct. Two alternatives (Alternatives 1 and 1A) west of Evansville were evaluated but are not considered preferred alternatives because of several factors, including impacts to numerous historic properties and construction cost. The construction cost of each of the western alternatives is approximately $1 billion. A second eastern alternative was also evaluated. Although this alternative, Alternative 3, utilizes approximately 17.2 miles of existing I-164, it travels just east of Angel Mounds State Historic Site, a National Landmark. Alternative 3 would travel south on I-164 and begin new alignment near the I-164/SR 662 interchange. Alternative 3 was not identified as a preferred alternative because of several factors, including impacts to the National Landmark and a high number of residential relocations at I-164/SR662. “The partnership on this project between Indiana and Kentucky has been phenomenal,” added Secretary Bailey. “INDOT, KYTC, the Evansville Urban Transportation Study (EUTS) and the Divisions of the Federal Highway Administration from both Indiana and Kentucky all agree that Alternative 2 is the preferred Alternative based on the initial investigations.” Public hearings to take comments on the DEIS will be at the Henderson High School gymnasium on March 16 and at Reitz High School in Evansville on March 17. Doors will open at 5 p.m. with formal presentations beginning at 6 p.m. for both hearings. Public comments will be accepted until Monday, April 19, 2004. Comments can be sent to Mr. Tim Miller, HNTB Corporation, 111 Monument Circle, Suite 1200, Indianapolis, Indiana, 46204, or by visiting the project Web site www.i69in-ky.com . Comments on the draft report will be considered before a Final Environmental Impact Statement is published within a year. U.S. Rep. Don Young, R-Alaska, chairman of the House Transportation and Infrastructure Committee, told the I-69 Executive Committee that a $6.2 Billion Federal Investment would complete I-69 through Kentucky, Tennessee, and Arkansas; however, funding is currently in jeopardy due to Congress. failure to renew TEA-21. If TEA-21 is not renewed by Feb. 29, the reauthorization bill could be delayed another six months. A study by the Evansville Urban Transportation Survey found that an interstate around the western edge of Evansville would cost $500 million and only carry 7,000 vehicles per day. It is assumed that a route the final preferred route between I-69 and the Breathitt Pennyrile Parkway will follow I-164 in Indiana before crossing into Henderson County east of the city of Henderson. The Kentucky Transportation Cabinet has posted information from public meeting concerning I-69 between Eddyville and Henderson. The joint Kentucky and Indiana group studying possible routes for the I-69 Ohio River crossing will hold an "emergency" public meeting to discuss three proposed routes for I-69 to connect Henderson and Evansville. They will have maps showing more detail than previous maps. The meeting will be held from 4pm to 7pm Monday, September 23, at Henderson County High School. The Kentucky Transportation Cabinet will be holding a series of four public meetings concerning the route of I-69 between Henderson and Eddyville. I-69 is expected to follow the Pennyrile Parkway and the Western Kentucky Parkway between these two cities. Thanks for Chris at I69info.com for the heads up about these meetings. INDOT officials have stated that a loop around Evansville is not part of the I-69 study. The study for "Segment 4" of I-69 is to determine a route to connect I-64 in Indiana to the Pennyrile Parkway near Henderson, Kentucky. Some local residents have asked INDOT to consider building new bridges to the east and to the west of Evansville. J. Bryan Nicol, commissioner of the Indiana Department of Transportation, recently made two speeches in Owensboro about the impact of road projects in Southern Indiana on the highway system in Kentucky. INDOT is widening US 231 from the new William H. Natcher Bridge to I-64. This project is expected to be completed in 2007. Eventually the widened US 231 will connect with the I-69 extension providing Owensboro with even better access to the road system. The decision has apparently been made that Kentucky's future Interstate 66 and Interstate 69 will apparently use existing parkways. As reported earlier on KentuckyRoads.com, the 2002 Kentucky Official Highway Map shows parts of the Western Kentucky Parkway, Natcher Parkway, and Breathitt Parkway as Future I-66 and Future I-69. On Feb. 25, the Evansville Courier & Press carried an article stating that the map indicates that I-69 and I-66 will follow the existing parkways. Email correspondence with Mike Hancock, executive director of the Transportation Cabinet's Office of Program Planning and Management, confirms that the decision has been made to utilize as much of the exiting parkway system as possible to route I-66 and I-69. Hancock said, "we are involved in a planning study that will help us determine the costs and impacts associated with upgrading the Parkways affected by I-69 to interstate standards. We will use this study to help us assess similar needs and issues relative to the I-66 Corridor." The parkways do not currently meet federal standards for interstates and will need to be upgraded before they officially become interstates. Federal legislation has directed Kentucky to use the Louie B. Nunn Cumberland Parkway as part of I-66 and the Julian M. Carroll Purchase Parkway as part of I-69. This legislation also directed Kentucky to erect "Future I-66" signs along the Cumberland Parkway and "Future I-69" signs along the Purchase Parkway. Hancock indicated that the Transportation Cabinet is working to erect this signs very soon. A new proposal to route I-69 west of Evansville between I-64 and Kentucky is being considered. The new proposal would route I-69 west of Evansville and build an elevated freeway through the Ohio River flood plain in southwestern Vanderburgh County, Indiana. There are currently nine or ten routes under consideration; however, the number of proposals should be narrowed to three or four before public meetings this summer. All nine routes face potential problems with archaeological sites, wetlands, and proposed parks and wildlife refuges in Kentucky. More information: Owensboro Messenger-Inquirer, Feb. 14 (no longer online), Evansville Courier & Press, Feb. 13 . The Division of Planning's 2002 Official Highway Map can now be downloaded from here . The map now indicated the proposed corridors for Interstate 66 and Interstate 69. Nine possible routes have been picked in the Evansville area according to this Owensboro Messenger-Inquirer article (no longer online). The routes include routes using I-164 east of Evansville and new terrain routes west of Evansville. Some would like to see I-69 be built west of Evansville to relieve truck traffic from industrial areas along the Ohio River in Posey County. Maps of the study areas can be found on www.i69in-ky.com . This Courier-Journal article provides a summary of engineering work being done to decide a route for the future extension of I-69. The article summarizes the history of the proposed route and information about work being done for I-69 in Indiana, Kentucky, Tennessee, Mississippi, Arkansas, Louisiana, and Texas. The Owensboro Messenger-Inquirer reports in this Nov. 8, 2001 article (no longer online) that plans for a wildlife refuge in Henderson County might interfere with proposed paths for I-69 between Henderson and Evansville. The Union County Advocate reports in this Nov. 7, 2001 article reports that the proposed Interstate 69 route across the Ohio River into Kentucky will be discussed at a public hearing set for next Thursday, November 15 at South Middle School's gym in Henderson. This Oct. 31, 2001 article (no longer online) reports that a Kentucky Department of Highways official told the Henderson Lions Club that construction on I-69 is still six to ten years away. It also reports that no final route for I-69 in Kentucky has been announced and that construction of an Ohio River crossing could take more than five years to complete. The Henderson Gleaner reports in this Oct. 23, 2001 article (no longer online) that transportation officials from Indiana and Kentucky are planning a public meeting for November 15 to discuss possible routes for I-69 between Henderson and Evansville. The Evansville Courier and Press reports in this Oct. 16 article that officials in Crittenden County are asking the KYTC to consider a route for I-69 along the Ohio River between Henderson and Paducah instead of a route using the Western Kentucky Parkway. The Gleaner (Henderson) reports in this October 4, 2001 article (no longer online) that an assistant state highway engineer told the Henderson Chamber of Commerce that very few decisions have been made. Among other things, he told the group that the Indiana Department of Transportation is taking the lead in choosing a route for I-69 between Evansville and Henderson. He pointed out that it still has not been decided whether the interstate should cross the Ohio River east or west of Evansville. He also said that while upgrading existing parkways to interstate standards remains an option for routing I-69 in Kentucky that is not the only option being considered. He said that the decisions will only be made after a period of public involvement. As a side note, I once asked the KYTC if any of the parkways meet interstate standards and the response was that none of Kentucky's parkways meet interstate standards. Work would have to be done to any of the parkways that might be included as part of the eventual routing of I-69 and I-66. The Gleaner (Henderson) reports in this Oct. 3, 2001 piece (no longer online) that state transportation engineers met today with the Henderson Chamber of Commerce about I-69 and US 60; however, there were no other details.